:Made for sharing, these are 51 double sided, playing card sized, messages celebrating the beauty of friendship, all packaged in a box. Give all at once to draw from for inspiration, or keep a box to tuck a message into a lunch bag, pocket or purse, or to pass around to friends in class or small group. Your small gift will be received with smiles and thanksgiving. 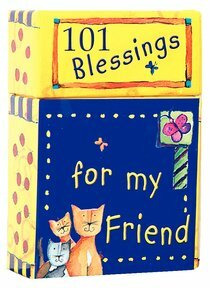 About "Box of Blessings: 101 Blessings For My Friend"